I have a great project under construction for a new client, DeWayne in Incline Village, NV. 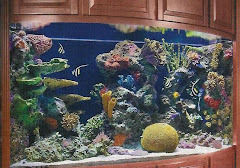 "D" has been working vigorously on his beautiful home with woodwork restoration, a home theatre complete with a three wall mural and a new 225 gallon reef tank. 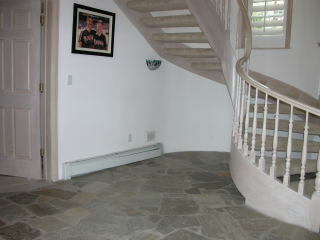 The aquarium will be located near his entry way/staircase and pool table. 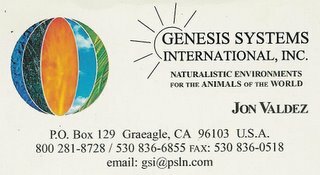 I am working with Genesis Systems International and Brian Hayes, Engineer, for the construction of the acrylic aquarium and aluminum stand. 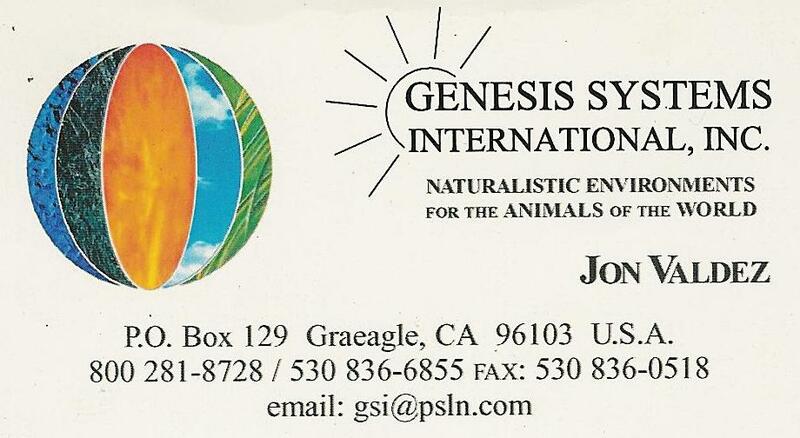 GSI constructs natural environments for the animals of the world in Graeagle, CA., about an hour north of Truckee. I will be adding many more photos and information on the construction of D's aquarium in the weeks to come. I plan to have water in the aquarium by early February, pending construction. 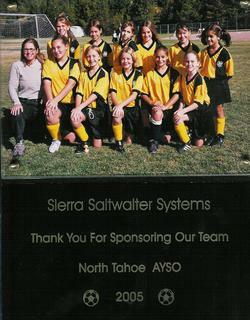 Sierra Saltwater Systems sponsored this girls under twelve soccer team coached by DeeDee Driller. DeeDee did a fantastic job coaching the girls and improvement was noted every week. 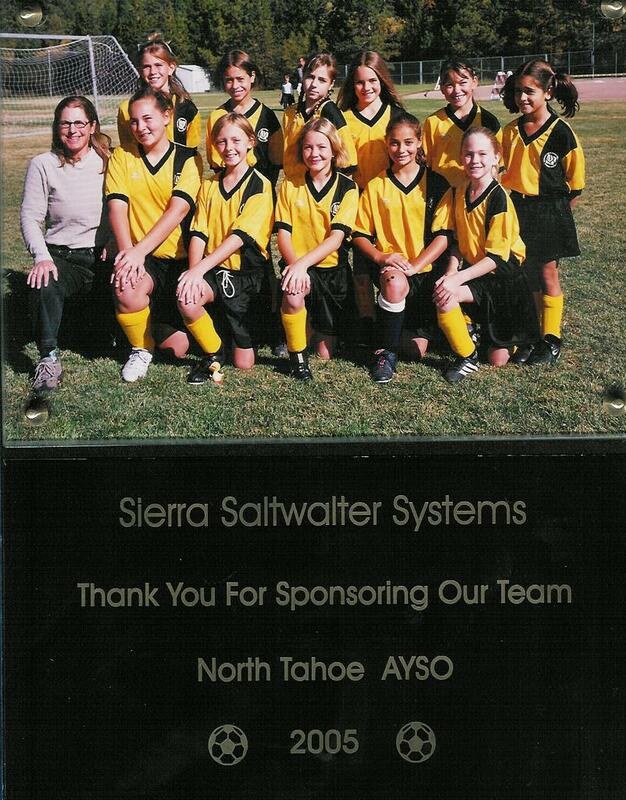 DeeDee is also the North Tahoe AYSO Allstar Team coach. She will then have a few weeks off before she starts coaching childrens ski programs at Squaw Valley USA. Sponsoring a team is a great way to give back to the community and support local youth. 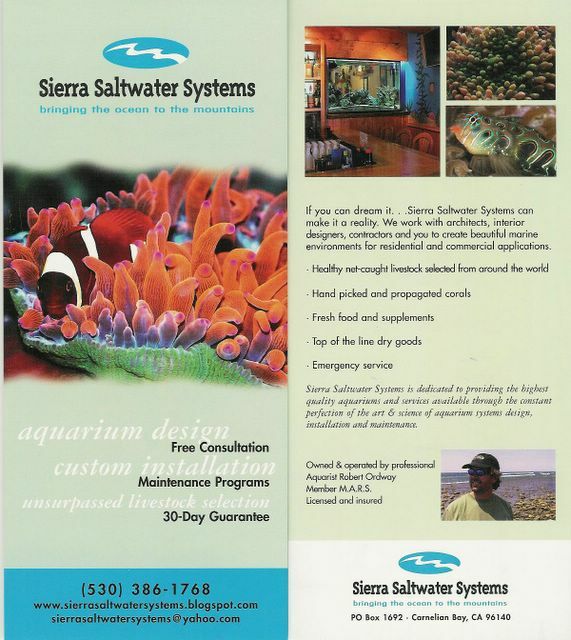 Sierra Saltwater Systems also donated and maintains a 55 gallon aquarium located in the Bluth Learning Center at the Boys and Girls Club of North Lake Tahoe in Kings Beach. My daughter Madison is located in the front row, second player on the left. 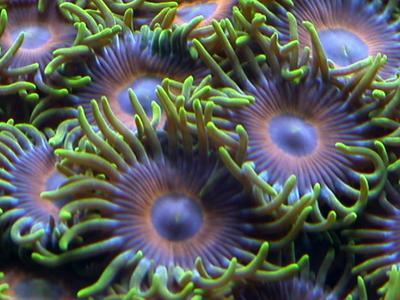 Skirt: Green, Fill: Orange/Violet, Mouth: Blue The often stunning colored Zoanthid polyp is a rapid growing soft coral commonly found in reefs around the world. 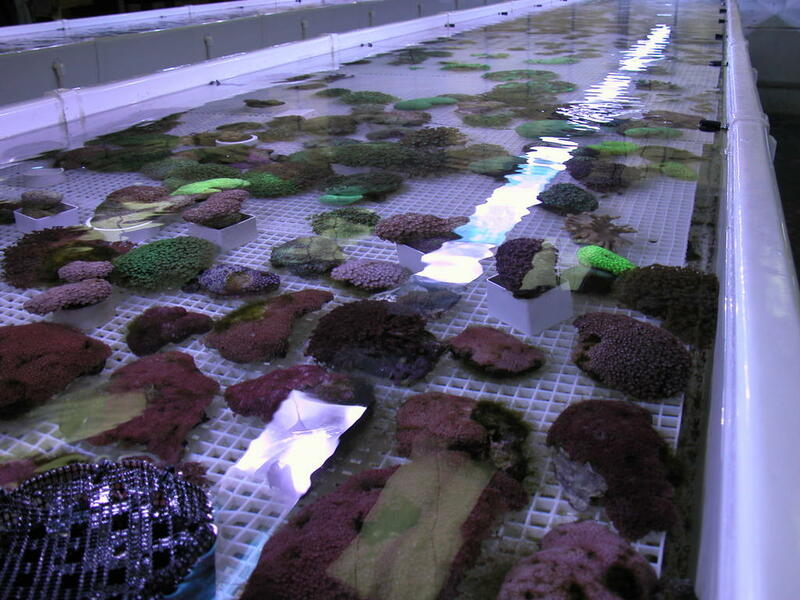 Like most corals, they obtain much of their nutrient requirement from the symbiotic unicellular algae called zooxanthellae. 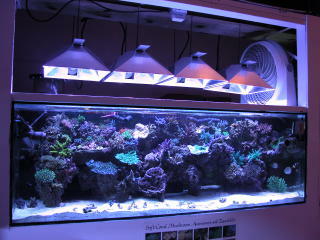 As a result, these corals are usually found not far beneath the surface and in the aquarium they should be placed high under intense lighting. Zoanthids contain the highly toxic substance palytoxin. Palytoxin is the most toxic organic substance in the world, but there is an ongoing debate over the concentration of this toxin in these animals. However, even in small quantities, the toxin can be fatal should it be ingested or enter the blood stream. Pacific Island tribes actually used the toxin on spear tips to stun prey animals and enemies. I have read stories of people losing their sense of taste for twenty four hour periods, eye infections and of a dogs death from eating the polyps. There is no known anti-toxin. Propagation is possible and easy when performed carefully. I propagate underwater with rubber gloves in the aquarium because the toxin is very soluble in seawater. The LPS (Large Polyp Stony) Fungia is an attractive short tentacle plate coral that is often found in a circular shape. Each coral is actually a single polyp with its mouth located near the center of its dome shaped body. The fungia are some of the most colorful LPS corals found in the aquarium trade. Usually found in shades of red, green and purple, they are also available in blue, brown, pink, yellow and orange. Fungia's are found on the reef slope and soft bottom free of waves and high current. Often found in large populations the family does not "sting" each other and can be found with many different species. This coral like the Helio fungia can walk the length of an aquarium, and back, until it finds a comfortable resting place. 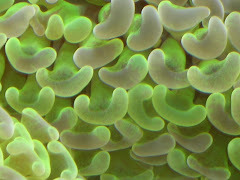 Placement of the Fungia should be taken with care because the corals movement can result in injury or death to another coral, usually never the Fungia. With over 99% of all saltwater aquarium fish being displaced from the ocean, it gives me great pleasure when I am able to add a captive bred or tank reared fish to a clients aquarium. Or in Kirk and Debbie's case, three captive bred Banggai Cardinalfish (Pterapogon kauderni) born and raised by Rian and Arlan, Western Marine Conference 2006 committee members, at UC Davis. The clutch was fifty-five, one of the largest in the hobby industry. If you're looking for captive bred Banggai's, Morgan Lidster of Inland Aquatics, Terre Haute, IN, Vice President of AMDA (American Marinelife Dealers Association) is a major Cardinalfish supplier. 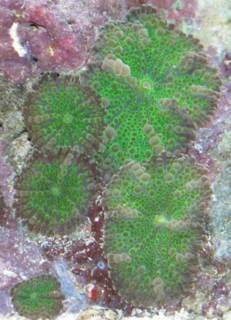 Also in the photograph is a portion of a propagated Green Slimer SPS coral. 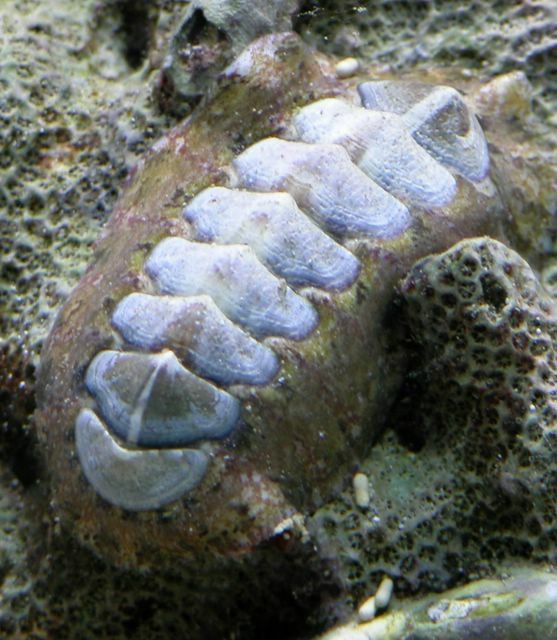 At less than a third of the size of the true giant clam (Tridacna gigas), the small giant clam deserves its name. As an adult, it has a large shell that adheres to a rock. When open, the bright blue, green or brown mantle is exposed and hides the edges of the shell with its prominent and distinctively smooth round edges. The Tridacna maxima clam is a bivalve mollusk, referring to the two valves on the mantle. These siphon water through the body to extract oxygen from the water using the gills, and to feed on algae. Clams are relatively hardy and well suited for the saltwater aquarium. One thing that must be kept in mind when adding a new specimen to an aquarium is that clams do not react well to being moved around. 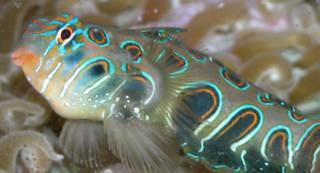 It is my recommendation that a good consideration of where you want to put your clam should be decided before placing it in your aquarium. 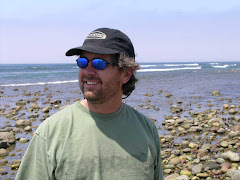 An excellent book available at amazon.com is Daniel Knop's "Giant Clams: A Comprehensive Guide to the Identification and Care of Tridacnid Clams". This book is the best source for information on the Tridacnid clams. The chapter on clam diseases is especially interesting, as is the information on keeping clams in the aquarium. Daniel Knop is also the Editor and Contributing Photographer for the German magazine Koralle, Coral magazines counterpart. 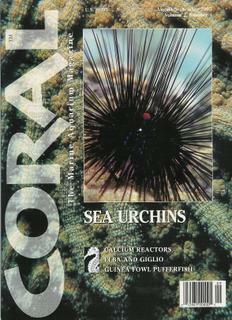 Coral puts out a fantastic publication on a bi-monthly basis. I subscribe to Coral magazine for my clients and they can look forward to receiving their next issue featuring Anemonefishes soon. I took a photo of this Electric Blue Hermit crab for a friend today and while my hands were wet I got some shots of other important clean up animals. I removed each creature from the aquarium and photographed them in a small translucent container. I use a Nikon Coolpix 5700 digital camera and had pretty good results using the macro settings. The Electric Blue Hermit Crab:The electric Blue Hermit crab originates exclusively from the Marshall Islands. This crab has electrifying blue legs with black banding, and its antennae stand out with its bright orange color. Both claws are close to being equal size, and are brownish green in color. This tiny crab lives in abandoned snail shells or it may resort to attacking and eating a snail so it can use the shell for its home. 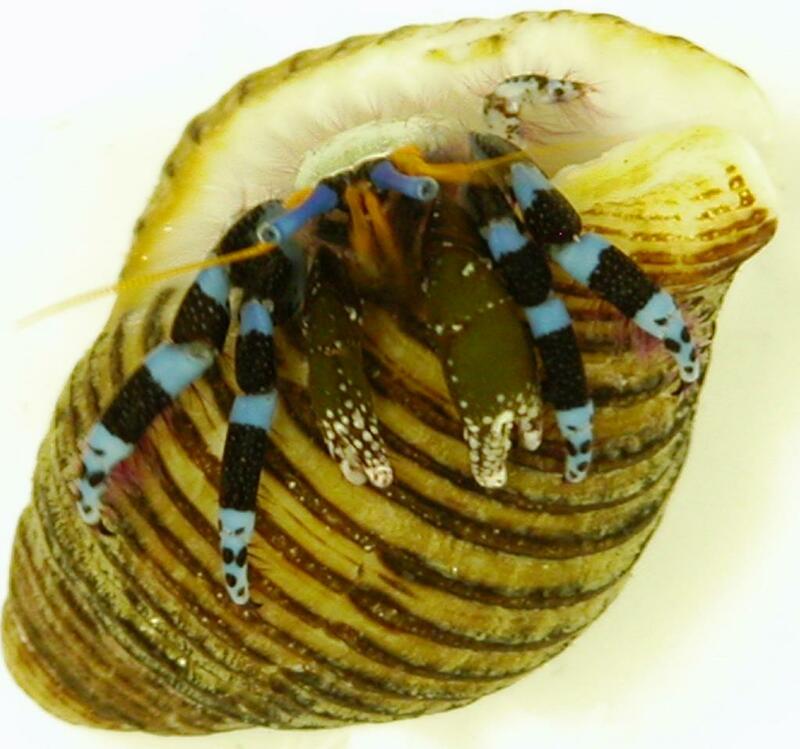 The Electric Blue Leg Hermit Crab is a valuable addition to an aquarium because it will eat algae including green hair algae and cyanobacteria. 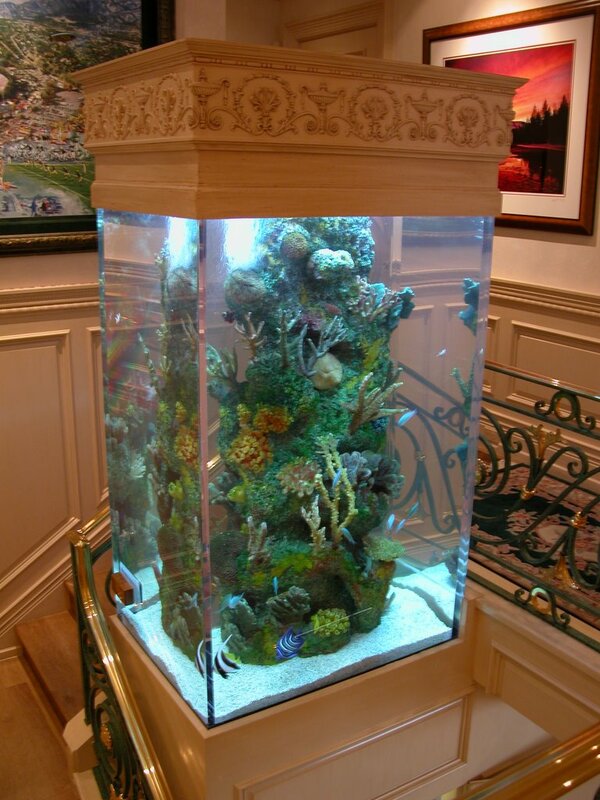 In addition, it provides valuable aeration by sifting through the sand and it is reef-safe! Pin Cushion Urchin:The Pin Cushion Urchin, Mespilia globulus, has an oval to round body covered with hundreds of uniform spines. I recommend an urchin be added to a reef aquarium upon initial set up to keep algaes from having a chance to get out of control. 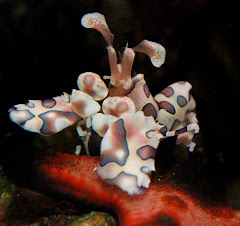 It generally hides in the rock during the day, at night, it comes out to graze on algae, moving about by its suctorial podia that are aligned in five doubled rows. The aquarium should include large amounts of live rock on which it can graze. Rock formations need to be stable and able to withstand the movement of the urchin wedging itself in crevices. 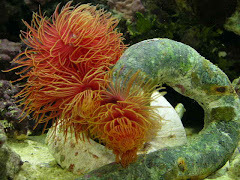 Polychaetes; Bristle Worms: With over 15,000 different types of bristle worms, some aquarium safe, some not, the novice reefkeeper is usually alarmed when they come across their first worm. Centipede like, their nocturnal behavior and their ability to hide in small holes or under objects allows many of them to go undetected. This bristle worm above out stretched is over six inches long. 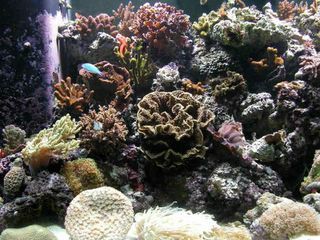 Often the populations in an aquarium can reach many hundreds or thousands, most of which are never seen. Although they have the potential for causing problems, generally small populations do no real harm in a reef system. A large population of bristle worms in an aquarium usually is a good sign of overfeeding. Bristle worms are absolutely wonderful at cleaning up detrius, arguably better than ANY other creature in your reef system. Others may say to get rid of them, I for one have a pretty good track record for healthy tanks and feel they are beneficial. I added this Sierra Saltwater Systems propagated Montipora capricornis to Debbie's 72G reef tank over a year ago and it has seen tremendous growth under the T5 lighting. 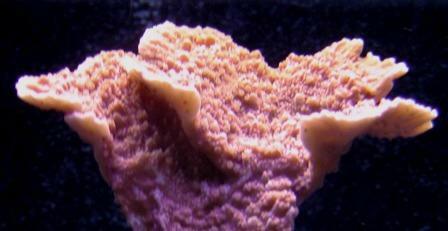 The capricornis is one of the more popular SPS (small polyp stony) coral found in reef aquariums. 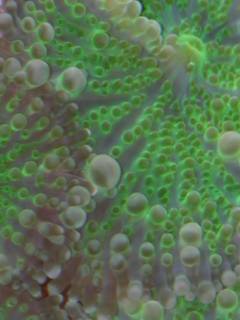 The swirling plates of the coral are unmistakable, a familiar and appealing growth pattern. The Monti cap is easily fragged for propagation, with broken pieces readily encrusting and starting new growth. Proper flow is necessary for the coral to achieve multiple layers characteristic of this morphology. Fast growers, these corals are highly recommended as first corals for new SPS reef tank hobbyists. 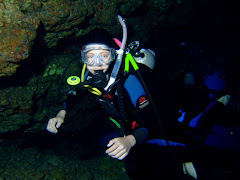 This is the same coral at a much younger age. 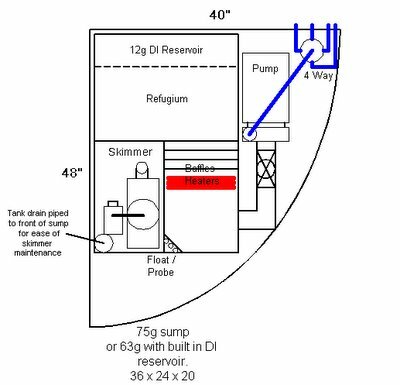 Debbie maintains near natural sea level calcium and alkalinity rates with the use of ESV B-Ionic Calcium/Alkalinity buffer system. Heliofungia actiniformis. This striking coral is located in the Design Center's 180 gallon reef tank in Reno. The heliofungia is a realitively easy coral to care for and will swell with water to allow it to "walk" to a desired position in an aquarium. This coral and all the livestock in the Design Center's aquarium is available for sale to my clients. 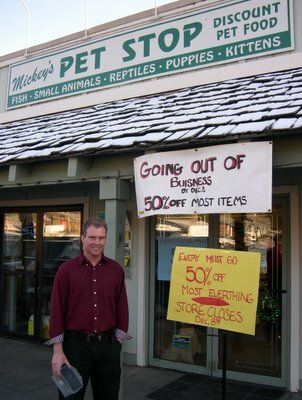 I encourage you to stop by and say hi to Dale Vogelaar, General Manager, at the showroom and see if there is anything in the aquarium that interests you. 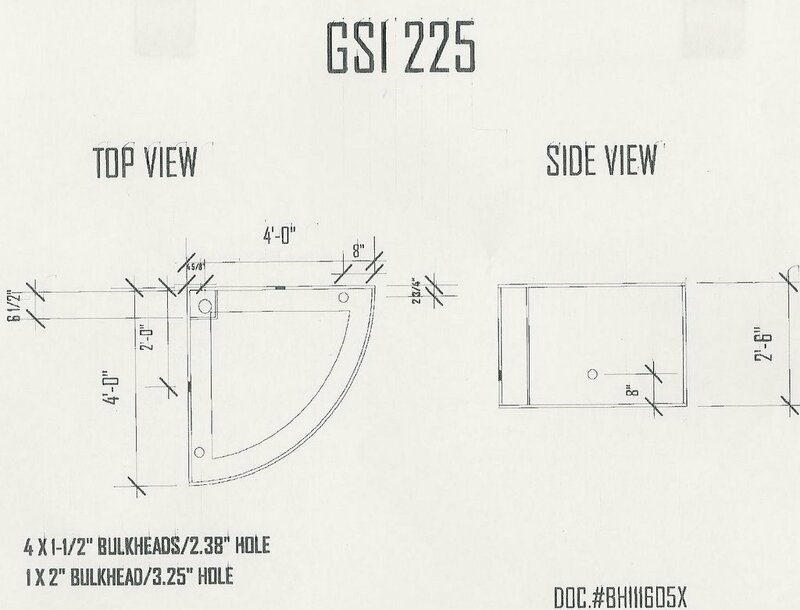 The Design Center is located at 780 Smithridge Drive, Suite 300 between McCarren and Pecham in the Magnolia Design Center. 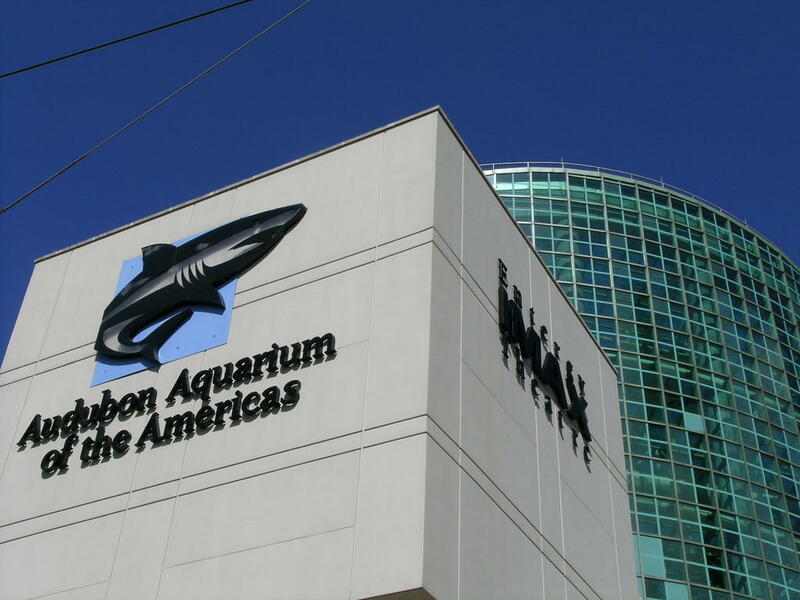 With all that is happening in New Orleans, I can't but wonder what the status of the Audubon Aquarium of the Americas is. The aquarium is located right on the Mississippi River within walking distance of the French Quarter. 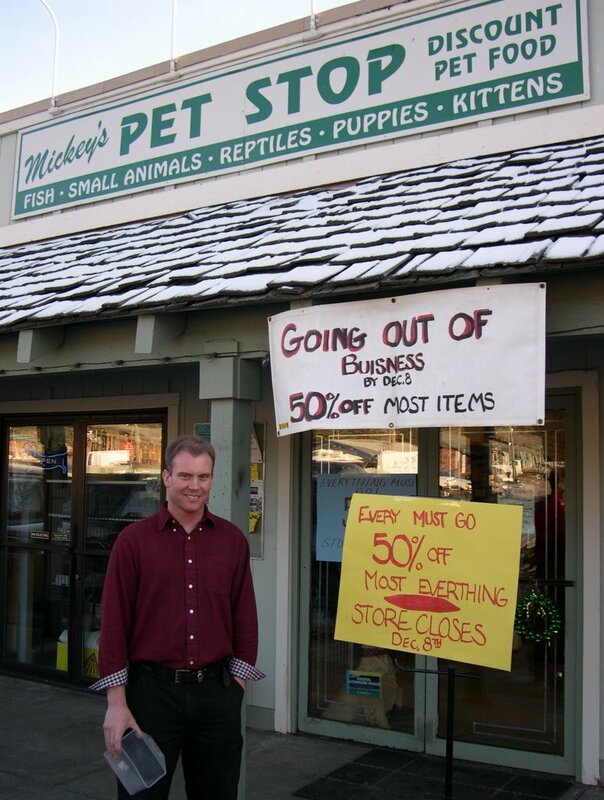 I have been there a couple of times and can only hope that the curators and volunteers had some time to relocate the animals before Katrina arrived. 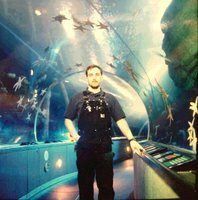 If you are looking for a unique way to help out with the situation in NOLA a donation to the aquarium can be made here. www.fragfarmer.com - Ready to Open! I had a nice visit with Eric Caamano at his newly remodeled shop last weekend, Central Aquarium and Reef in Upland, California. 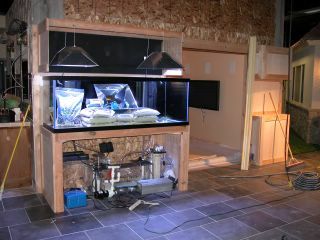 Eric has added three or four new large set ups, plus a new fish/invert compartment tank. He has also added a large amount of dry goods at very reasonable prices. Look for the fragfarmers.com/Central Aquarium new website to be launched soon and if you're in Southern California, his grand opening is scheduled for September 10th. Eric is a great supporter of the Western Marine Conference 2006 and will be attending as a vendor. Mono Lake: Brine Shrimp Everywhere! On our recent trip to San Diego and Scripps Institute of Oceanography, we made a quick stop at Mono Lake's South Beach to view the tufa formations. I had been to Mono Lake a number of times, but never in the summer months. I was amazed at the number of brine shrimp along the shorelines. The shrimp is an ample food supply for the number of birds populating the area. Brine shrimp used in a marine aquarium has little nutritional value, but is often used to entice new additions to eat. Mono Lakes ph is over 10 and the specific gravity is an astonishing 80.8 parts per thousand (1.060 sp), where natural sea water is at about 35 ppt. 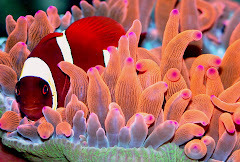 Kathleen Wood, Editor for the U.S. publication of Coral Magazine wrote a fantastic article about patience as a key to success in keeping reef or fish only aquariums. 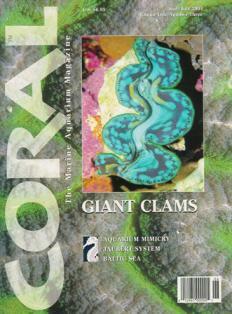 I subscribe to Coral Magazine for many of my customers to help them learn about keeping marine animals. This issue has a wonderful subject matter on keeping sea urchins. Urchins are fantastic additions to reef tanks. They do a great job in keeping undesirable algaes in control and even help promote coralline algae growth by releasing spores as they eat. Unfortunately, urchins can not be kept in acrylic aquariums due to the fact that they will scratch the surface of the aquarium as the eat diatoms off of the acrylic. 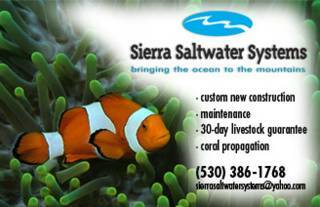 Pick up a copy of Coral today at your local fish store. Their articles and photography are the best in the hobby industry. I made a quick stop off at Pacific Aqua Farms in Los Angeles earlier this week to pick up some livestock on my way home from Baja California. PAF's is the worlds leader in aquacultured corals that are grown in their Fiji and Tonga locations and then shipped to Los Angeles for worldwide distribution. 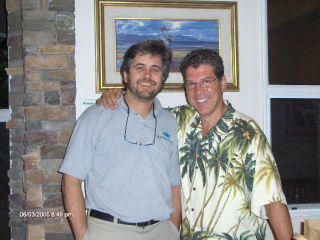 Walt Smith, owner of PAF will be a speaker at next years Western Marine Conference in Sacramento April 21-23, 2006. 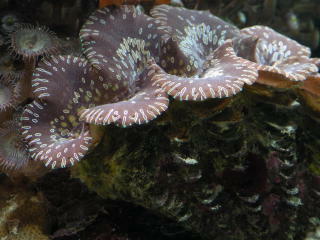 I have recently added sea hares to my inventory and am using them on a few clients' aquariums with hair algae problems. Hair algae grows from having high phosphates in the aquarium. Phosphates are often created from overfeeding. 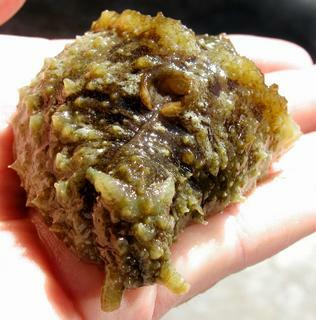 The sea hare is a ferocious algae eater. A sea hare will devour an aquarium's nuisance algaes until it no longer has a food source. 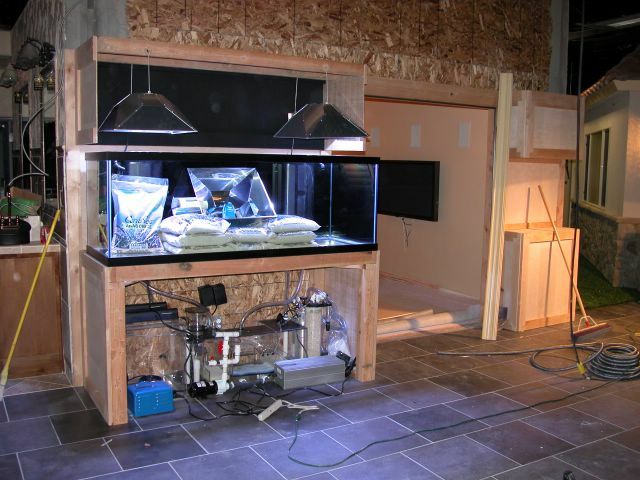 At this time a dedicated aquarist will transfer the animal to another home. According to The Monterey Bay Aquarium's Living Species List, each sea hare is both male and female, but they still need to mate. Dozens pile up for sea hare orgies. They mate in lines and circles: each is male to the one in front and female to the one behind, so each is both a mother and a father. Sea hares may lay up to eighty million eggs apiece. But most of these mother-fathers' eggs are eaten by predators. 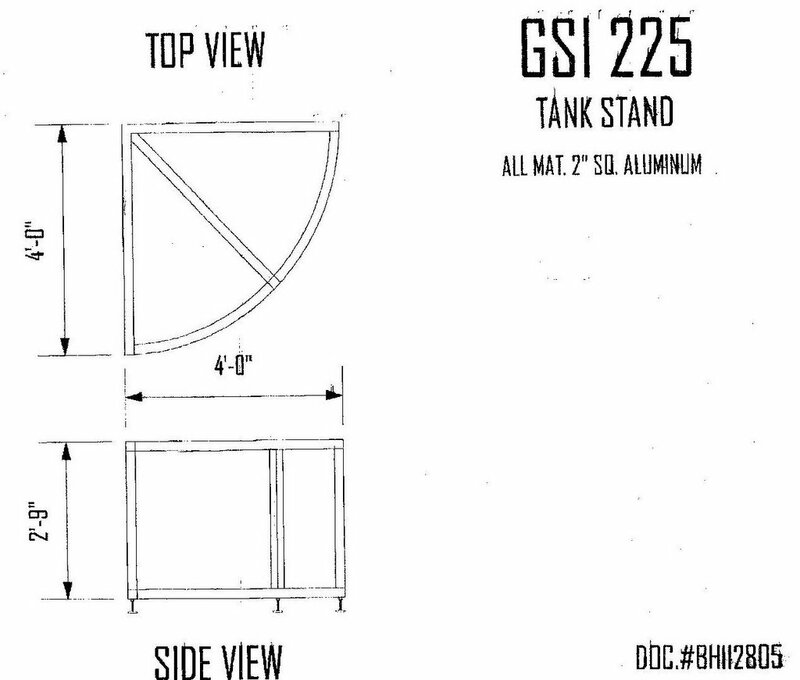 I recently got started on The Home Show's 180 gallon future reef tank. Over the three day weekend I will load it up with 275 pounds of Marshall Island, Kaileni and Tonga Branch rock. Some technical information: All of my acrylic work, sump, refugium, skimmer and calcium reactor was made by Jeff Turcheck at LifeReef. 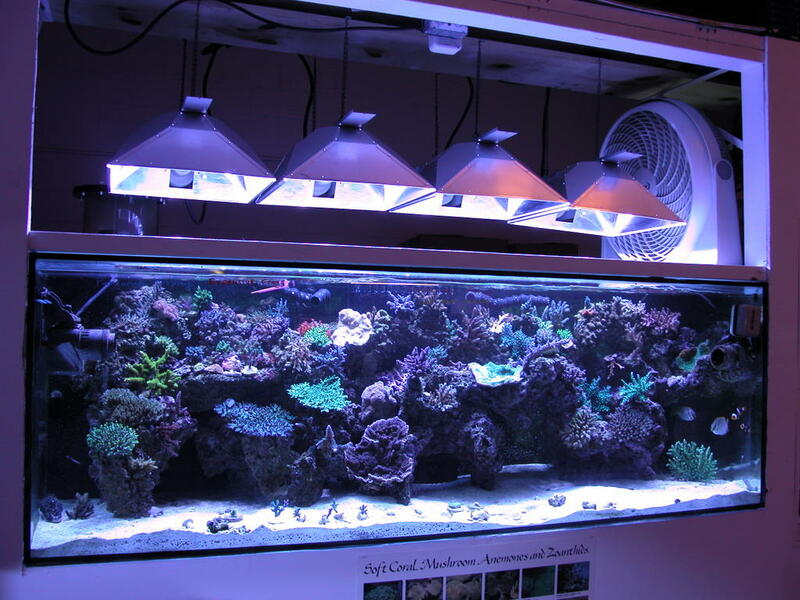 Lighting is the LumenArc 3 reflectors from Pacific Garden Supply and PFO & BlueLine ballasts (that will go above the aquarium) with 14K bulbs, purchased through Innovative Lighting Solutions . I believe these companies are not only the best in quality, but also surpass all excpectations in customer serivice. 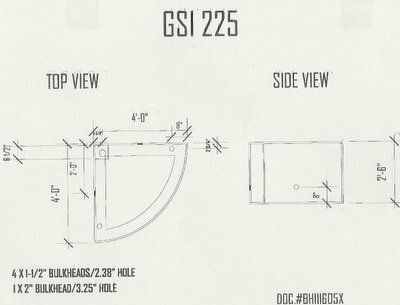 This project will be a showcase of my company. Look for many future posts to come! It was bound to happen.... This tank raised Yellow Striped Maroon Clownfish in Chuck and Cindy's artificial reef tank has taken to the Condylactis Anemone. Cindy provided me this photo. If anyone has a nice shot of their aquarium, please send it to me and I'll add it to my blog. 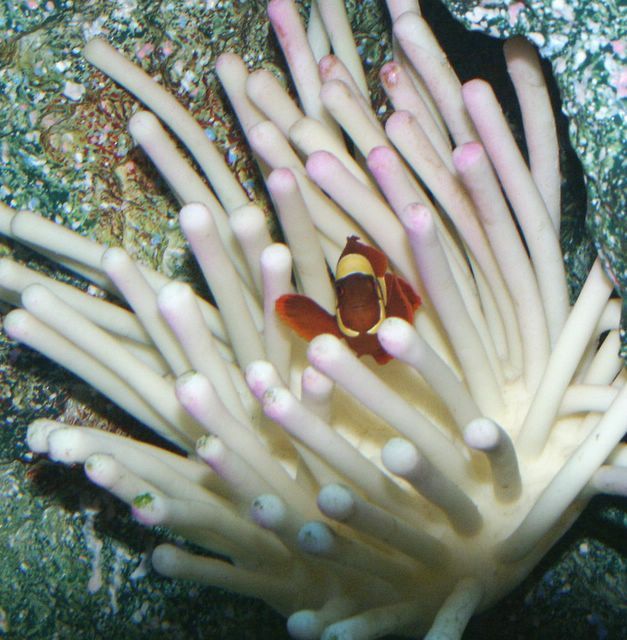 EDIT 5/23: Cindy has informed me that the YS Maroon has started to "feed" the anemone! 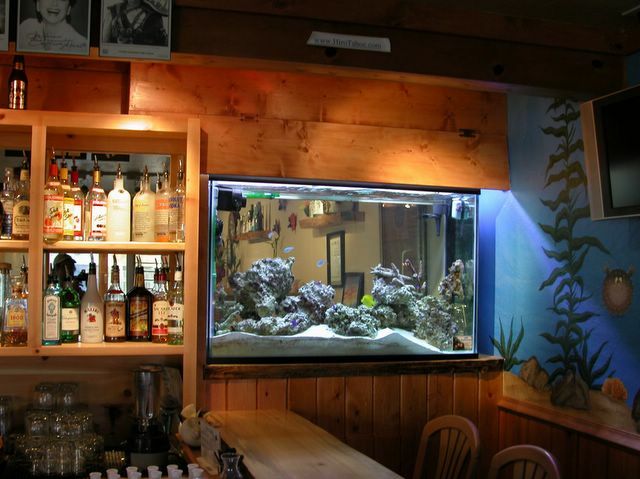 Marine Aquarist Roundtable of Sacramento is proud to be hosting the Western Marine Conference 2006 at the Red Lion Inn in Sacramento, April 21-23, 2006. I am on the committee to bring in over a dozen of the most knowledgeable speakers in the hobby industry. Also, we are hoping to have over 25 vendors to showcase their products. I recommend all of my clients to attend. Scheduled to attend are: Bob Fenner, Eric Borneman, Anthony Calfo, David Cripe, Leng Sy, Mike Paletta, Walt Smith and more. Shelley Fallon, Fallon Multi Media, created this ad for me today to go into the new Home Style Magazine. Home Style Magazine is a quarterly publication that gives professional bulding industry businesses a chance to reach the everyday consumer. In partnership with Bob Principe and the Home Show,(www.bptv.tv) , KRNV Channel 4 (Reno), the Homes Style Magazine will reach over 150,000 readers quarterly. 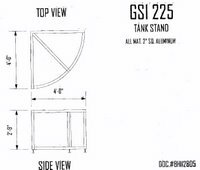 I will be setting up a 180 gallon reef tank at the Home Show showroom in Reno next month featuring what I consider to be the best equipment in the aquarium industry.